Jean-Pierre Melville's work in the realm of thieves and gangsters embodies the very essence of "cool". He peppers minimal, surgically-used dialogue in scenes that move through urban environments with a deft awareness of immediacy, knowing when words are needed and when silence stands paramount. Though Melville's iconic Le Samouraï and Bob Le Flambeur focus on the composure of criminals in this silence, analyzing their instincts and maneuvers, his next-to-last picture Le Cercle Rouge concentrates more on the magnetic pull that draws them together, along with an exploration of the "honor amongst thieves" idea -- and lack thereof. With very few words spoken and Éric Demarsan's music backing the movement, it's at once a cat-and-mouse caper, an intriguing character piece, and a brilliant heist thriller that, though restrained, rarely feels the length of its brisk two-and-a-half hours. 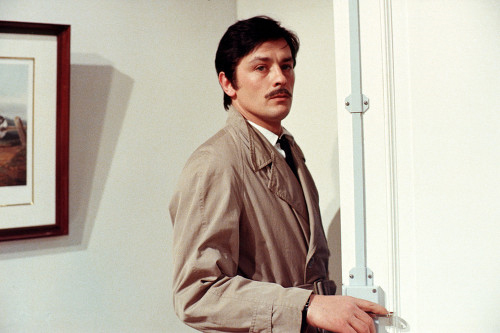 Melville again teams up with Alain Delon in Le Cercle Rouge, employing his chiseled jaw and piercing eyes to bring smooth criminal Corey to life. Recently released from prison and jettisoning away from his previous mobster employer, whom Corey's just robbed, he happens upon a high-profile escaped criminal named Vogel (Gian Maria Volonté), currently being hunted by the shrewd yet soft-spoken Captain Mattei (Bourvil) in an expansive search stretching across the city and countryside. With both men needing a way to obtain financial security so they can essentially go underground and disappear, they orchestrate a heist on a ritzy, loaded jewelry store in the heart of Paris. Along with the assistance of a compromised, boozed-up ex-cop named Jansen (Yves Montand of Z), the three men plot a way to bypass the security, grab the jewels, and fence their millions of dollars worth of gems. Before the opening credits, Melville posits a (fake) Buddhist saying that suggests destiny leads like-minded individuals to a given point, "the red circle". It introduces the concept of predestination and the futility of deviating from that path, as well as nudging towards an even field for those that enter it. Melville sets the tone with the anecdote by planting it as a provocative seed long before the point where the criminals meet, giving a little something to chew on as Corey and Vogel escape the law and Jansen -- someone who once prosecuted the wicked -- assists in their ploy. The French director habitually toys with the morality and mentality of criminals in his oeuvre, fascinated with the honor code among them, and Le Cercle Rouge certainly doesn't deviate for that; yet there's an infectious air of fortune and doom that lingers throughout Melville's film, one that injects philosophical vigor in the mix. The story that follows isn't as complex or cryptic as its prologue, but Melville writes it with a razor-sharp, matter-of-fact edge that makes it quite gripping, aided exponentially by pitch-perfect performances. Le Cercle Rouge follows a structure familiar to those both seasoned to the heist film genre and to Melville's work, sectioned into three chunks that follow the escape, the meeting, and the execution of their endgame. Under Melville's pen, though, this structure achieves a certain fluidity that's rarely seen in works outside of the French director's catalogue, in which he makes each subtly-introduced element an essential component. He's acutely aware of the cinematic language and the way it communicates to the audience's senses and sensibilities, which becomes highly noticeable when he presents how someone picks a pair of handcuffs or how a horde of French police officers line up with their dogs on a long, grassy field. And let's not forget the rhythmic dance number in the pit of Santi's club, where Corey sits stoically, alone and unaffected by the place's energy. Melville's suave style melds Le Cercle Rouge together into an effortless rush of sober, complete cinematic craftsmanship. Smooth camera work lets mannerisms to speak louder than words would, allowing the two convicts' stories to stay partitioned at first, then interweave near the film's second half. Melville takes his time as the tempo methodically burns, allowing Corey and Vogel's demeanors to manifest before our eyes in a way that familiarizes us with them, replacing the strings of dialogue that would construct predictable byzantine archetypes with a perceptive, meaningful eye for human interaction. Just as the film requires a breath of air from its stifled glances at gloomy antiheroes, Melville intuitively integrates a moment of circumstantial anxiety -- a vehicle roadblock here, crossing a river there. Between the weight of their weathered tempers and the suspense scuttling behind their escape, there's never a lack of tension. The crucial boiling point in Le Cercle Rouge comes in the brilliantly-executed heist, which takes up over half an hour close to the film's conclusion. There's so much to marvel over within Melville's restrained, steadfast hand here, which utilizes the silence that the thieves painstakingly avoid instead of sprucing it up with energetic music to give it a false sense of momentum. No, this film relishes in the soundless air around and in the jewelry store, which allows the slightest of noises -- the pitter-patter of sock-adorned feet, the cutting of glass, the cranking of a tripod -- to replicate the gust of nervousness that they'd likely experience. Melville handles all the well-researched details, from the makeshift tools used to the layout of the building, with such an unforced poise that it's simply breathtaking to watch in motion, like watching the gears move in an expensive timepiece. You know what it's doing and what'll come of the mechanics in motion, but that doesn't hold someone back from acknowledging its mesmerizing execution.